Salvation And Survival: "There Is Therefore Now No Condemnation For Those In Jesus Christ"
"There Is Therefore Now No Condemnation For Those In Jesus Christ"
Author J. Lee Grady wrote an article on Charisma News applauding the appearance of Beth Moore as a speaker at a Conference of Pentecostal associations and churches. Grady wrote that Moore's speech was "so convicting and so saturated in the Holy Spirit .... that people wept, prayed, and sobbed uncontrollably". Grady stated that Moore based her message on Jeremiah 12:5: "If you have run with the footmen, and they have wearied you, then how can you contend with horses?" He wrote that "Moore lamented the powerless state of the modern church and called us back to the raw authenticity of New Testament faith". And then came the statement that has [not surprisingly] set the angry tongues wagging at Pulpit and Pen... "We are settling for woefully less than what Jesus promised us," said Moore. "I read my New Testament over and over. I'm not seeing what He promised. I'm unsettled and unsatisfied." She added: "I want holy fire!" Amen, Sister! Now, it has become clear to me why there is such an ongoing and aggressive attack upon Beth Moore. She has stepped outside the Church's rigid box of acceptable doctrine concerning the supernatural effects of the Holy Spirit, and is being accused of not following in lock-step with the man-made teachings of the Biblical text. As she says, when you read the New Testament "over and over" with a mind and heart that seeks God's perspective on what and why He inspired the writings, you get a Kingdom mandate that is different from the stereotypical and formulaic variety of teaching and preaching the Word. You see that Jesus wants more from us than regular Church attendance and a narrow view of our responsibilities as Christians. He wants bold and courageous followers who [like the Apostles] dare to walk in His radical footsteps. He wants a Church walking in His power! And that scares the majority of comfortable Christians. Moore is calling for renewed minds that are in step with Jesus and His promises; for Christians who have had the Light of God shine upon His Word so that they see what our Lord has called us to do in living out our faith -- Christians that see with unveiled eyes and understand with pure hearts that God is a consuming fire -- and Believers who desperately seek His Presence and that Holy fire in their own lives! Beth Moore wants "holy fire", and so do I! In the Old Testament, God, Himself, lit the fire on the altar of burnt offering, and charged His priests to keep it continually lit. As New Testament believers in YHWH, our bodies are living sacrifices upon the altar of God, and His Holy Spirit is to engulf our hearts and remain inextinguishable. That holy fire within us exhibits God's Presence, His passion for His children and His Kingdom, and His desire to purify us for good works for that Kingdom. All of that is our right as Sons and Daughters of God! But that "right" comes with some conditions ... we should be crying out for, embracing, and receiving that Holy Spirit fire. We must trust in, and rely on, the power of Jesus's Name to continue the works He did for the Father [including healing the sick, casting out demons, and raising the dead]. We must be spiritually transformed, with renewed minds, and sanctified to do these works for the glory of God alone. But do we see that happening in the Body of Christ today? That is what Beth Moore is calling our attention to, and those who are satisfied and settled in their complacency are made uncomfortable by that calling. And, so they condemn and criticize and censure. But how many of you can identify with Beth Moore and Jeremiah 12:5? How many of you lament the powerless teachings of the modern Church? There are so many promises given to us in the Bible; promises that we have a right to expect as Sons and Daughters of God. But, as Beth Moore explicitly states, we are settling for less than the inheritance due us. Among those stated promises is this: we have been given authority to trample on demonic spirits, and are able to exercise that authority over all the power of the enemy, with no harm coming to us. We have been promised that whatever we bind on earth shall be bound in heaven, and whatever we loose on earth shall be loosed in heaven. Jesus gave us the promise that if we have only the faith of a mustard seed, nothing will be impossible to us. We have been given the promise of treasure in heaven. We have been promised persecution -- but it will give us the blessed opportunity to testify of our Lord before the world. We are promised a kingdom and a place at Jesus's table in His Kingdom. We are promised that He will do whatever we ask in His Name, so that our Father will be glorified by His Son. We are promised that He will abide in us and we will bear much fruit. We are promised that our joy will be full, and we will not stumble. We are promised that we will be made holy and set apart by God's Truth. We are promised power when the Holy Spirit comes upon us; and signs will accompany us in that power. These are just a few of the more than 200 promises in the New Testament, and these are only the promises we can expect in this present age. There are many more promises to be fulfilled in the future Kingdom! But all these promises are due the Children of God who believe them and trust in Him who pledged them -- and who are willing to act out their faith. Beth Moore and so many others are simply willing to step out in faith and receive those promises, seeking the fire and the guidance of the Holy Spirit to do Christ's bidding. But here's how the Enemy blinds the hearts and minds of the Body of Christ ... with headlines that scream, Beth Moore is Unsatisfied With Christ. They are so twisted in their minds that they cannot see that it is the modern Church that is unsatisfactory to her, not Jesus! Why are they so afraid to seek after the promises Jesus offers those who trust Him? How do their unregenerated hearts hear the false whispers of the Enemy who translates her words into conflicting statements such as this: Jesus promised eternal life to those who would repent and believe in Him. Is she denying that this promise is being fulfilled? Is there something more than this that she wants? Who could make such a claim? Of course, this is one of the deceptive errors of Pentecostalism and charismaticism–that God owes us anything and that His Son Jesus is not enough. And there, we also see their fear of any supernatural relationship with Jesus or the Father. That is why so many of us have also become wearied by the "footmen" of the Church. Can you see how Satan has blinded them and twisted her words? Can you now understand why so many Christians are living powerless and fearful lives? For those who have ears to hear, and eyes to see, it is not difficult to discern the schemes of the devil and the presence of a religious spirit. But there is a remnant in this generation that is following Jesus's command to seek the Kingdom first. 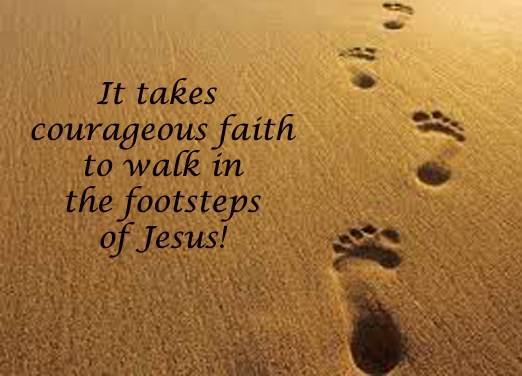 We will not be intimidated nor pressured into standing down from our Lord's invitation to walk in His footsteps. I, for one, am thankful that Beth Moore is letting the Light of God guide her as she boldly and confidently walks that narrow path towards Heaven's gates. As long as she faithfully represents Jesus's Kingdom message, I will stand with her. But it is no wonder that those who choose the easier and more frequently traveled route think themselves the wiser. I'm afraid they will find themselves put to shame by their arrogance and rejection of the Word of the Lord. It is much easier to condemn than to diligently seek the Truth. Please feel free to click on the following links and read the article by J. Lee Grady on Charisma News, and the opposing viewpoint on Pulpit and Pen. Then I welcome your prayerful discernment and comments. Matthew 15:14 "Let them alone; they are blind guides of the blind. And if a blind man guides a blind man, both will fall into a pit". Pam, excellent discernment... the word of wisdom from on high the Spirit is showing to you. I am also sensing that what you've uncovered also has to do with the prophetic messages we've been hearing lately that the Elohim is beginning to expose those secret things hidden in the darkness. I believe that as you've begun stepping out and boldly speaking what the Spirit is laying upon your heart that the depth of discernment is going to increase exponentially. O, and I was going to email you something which the Spiriit has been revealing to me about your post of 'Wise As A Serpent, Innocent As A Dove'. I'll try to see if I can do it on here this way. What Father has been showing me is that the knowledge which comes to us is His which the Spirit distributes to each. And I need to explain that from the perspective which it was shown to me. When I died in that truck rollover(an NDE as it's known) I only had to focus my 'intention' or 'attention' on whatever I was interested in and instantly, as we know it from our human/fleshly 'time'-frame, I received all knowledge of that, whatever I chose. And it was not a subject or course of study, it was only a man's knowledge from his lifetime of work on earth. That knowledge I received on that day-those, maybe 15 mins maximum?- it has taken me almost twelve years to put together and understand to create something useful out of it. Why am I telling you this about knowledge and work and creating something. It's because I believe that this 'knowledge' that we have and use to work and create and play with is held someplace like a library but it felt more like what one would call a 'virtual'library. As I was there and that's a really awesome experience to be liberated from this body of flesh! !...it felt like jumping from a 'popping Johnny' tractor into a 'UFO with magnetic hyper drive all set for silent, instant mode'... the last 12 years has been the loneliest, the most constrictive wilderness experience I've never been able to imagine while at the same time I would never trade it for the whole world if it were offered. I've never been able to get as close to Father as I have these last almost twelve years(it will be 12 years on 9-16-17, Hebrew way of counting) and especially when He lead me out of her, the whore riding upon the beast and has shown me what that beast is that I was riding on. It makes me look at the time I was 'in her' like the time one is searching for the forest but cannot find it because of all the trees in the way. He had to shake me enough to get me to let go of my 'security blanket' I had with the beast and lead me to abandon all of it. The reason behind that Ive been realizing is that He sent some ahead to prepare the way and your timely article on the 'forerunners' has been what I've been crying out to Yah these last several weeks for and now He is using you to confirm to me what He showed me to do and why. I have some revelation which I want to share with Mark also about what the Spirit has shown me of where his function in the body and some strategies which he can employ in your ministry. O yeah and that was one other thing about wise as a serpent and innocent... was referring to also. It has to do with the strategy which armies employ and how Yahuwshua used that same strategy in picking His apostles. I don't think I can send that 'note' I wanted to this way so I'll try another way. You've always got something prophetic to share ... and I thank God for your voice in this wilderness of our carnal life. Mark is interested to hear what you have to say and wanted me to ask if you have ever read a couple of books by Ian Clayton, called "The Realms of the Kingdom" (Volumes 1 & 2). He says it is a whole different way of experiencing God, and says it sounds similar to what you have come to know in your last 12 years. Thanks, as always, for giving your special insight to what our Father is showing us in these last days.